There is a National Curriculum that was introduced to all schools in 2014. The main aim of the new curriculum is to raise standards. The new curriculum is intended to be more challenging, focusing on essential core subject knowledge and skills. The new National Curriculum is only a small part of a school’s overall curriculum. At Holly Park we have been moving towards this new curriculum over the last couple of years. Schools are not expected to have the new curriculum fully embedded until 2017 but at Holly Park our teachers have already been using the new curriculum. All of the teachers have been looking the objectives and topics to be taught in their year group and deciding how to group them together to make coherent learning projects across the year. Please click on the link below to see the Holly Park Curriculum Map for the academic year. Here are the Learning Schedules for each year group. This covers in outline all topics each year group will cover. At Holly Park we have outstanding provision in the Early Years and Foundation stage. Our Nursery and Reception classes are bright and lively environments where children make excellent progress in their learning through a balance of self initiated play and adult led activities. Children have free-flow access to both indoor and outdoor provision. In Years 1 and 2 we continue the implementation of an ‘integrated day’, which aids transition from the Early Years and feeds into the cross curricular approach we take when implementing the National Curriculum. At Holly Park we are constantly developing our provision to meet the needs of our pupils. Children here experience a fun and innovative curriculum where areas of learning are taught via different ‘topics’. Teachers creatively link subjects together to build exciting units of work and plan activities to challenge and motivate their pupils. A full broad and balanced curriculum is on offer here, with music being a particular strength of the school. We ensure that statutory curriculum requirements are adhered to, but each teacher has the freedom to take their own approach as to how best to deliver their lessons, ensuring optimum learning and progress for their cohort of pupils. This means the school is constantly buzzing with fresh ideas and enthusiasm as the excellent team of teaching staff work effectively together, while pupils proactively engage with their learning. Pupils are encouraged to develop the Holly Park Learning Skills as they progress through the school. The 6 Learning Skills are: Commitment, Creativity, Self Management, Reflection, Enquiry and Team work. Please refer to the separate section for more detail on these Learning Skills. What subjects are taught at Holly Park? This subject is divided into the following 4 sections: ‘Speaking and Listening’, ‘Reading’, ‘Writing’ and ‘Phonics & SPaG’ (Spelling, Punctuation and Grammar). Studying English gives children the ability to express themselves creatively and imaginatively and to communicate with others effectively. English forms the basis of many topics as so many other subjects can be explored through drama, reading (both fiction and non-fiction) and writing for different purposes. The children at Holly Park have fortnightly lessons, taught by an additional teacher, that focus specifically on phonics and spelling and serve to consolidate and enhance the learning that has been taking place in the classroom already. This subject is divided into the following 5 sections: ‘Thinking Mathematically’, ‘Number’, ‘Handling Data’, ‘Calculation’ and ‘Shape, Space & Measures’. Learning Mathematics equips pupils with significant skills and thought processes that will enhance their everyday life. At Holly Park we stress to the children how important it is to have a good grasp of their times tables. We operate a system of timed, levelled challenges with certificates for each level passed. The children at Holly Park have fortnightly lessons, taught by an additional teacher, that focus specifically on mental maths and serves to consolidate the learning that has been taking place in the classroom already. This subject is divided into the following 4 sections: ‘Investigation and Enquiry’, ‘Life Processes’, ‘Materials’ and ‘Physical Processes. Science is a great subject to incite curiosity and to encourage children to develop enquiring minds. Pupils gain knowledge to answer questions about the world around them, but also are inspired to extend their knowledge through further enquiry. This is a rapidly changing subject as technology develops at such a fast pace. Our ICT team work hard to keep our curriculum relevant and up to date. We have 4 laptop trolleys in the school so children are able to use computers to enhance their learning across the curriculum. Children are also taught explicit skills in ICT for example using digital media or controlling devices. Through this subject pupils examine the natural and human worlds. They develop their knowledge of places and environments throughout the world and encounter different societies and cultures. The work of our school Eco Council has direct links to Geography. In History children learn about past societies and consider how the past influences the present. They build a chronological framework based around significant events and people. Pupils gain an understanding of people and their experiences, which can influence their personal choices, attitudes and values. Through Design & Technology pupils are encouraged to solve problems creatively. They combine practical skills with an understanding of specific requirements for a product. It is a subject where children learn how and why things work and have a chance to use that knowledge to create something new. As they progress through the school, children develop their artistic skills in drawing, painting, 3D, textiles, printing, collage and ICT. Art is a subject that lends itself well to a class’s topic and so frequently you see other subjects ‘come to life’ through art. At Holly Park we teach the agreed Barnet syllabus for Religious Education where different religions are explored through key themes such as ‘Symbols’ or ‘Celebrations’. Every year group at Holly Park will make a visit to a place of worship to enhance pupils’ understanding of other religions and religious practices. PSHE (Personal, Social and Health Education) and Citizenship help to give pupils the knowledge, skills and understanding they need to lead confident, healthy, independent lives and to become informed, active, responsible citizens. This area of learning permeates the everyday life of Holly Park School, where we are constantly working to develop pupils for the wider world. We use the themes ‘Myself’, ‘My Relationships’, ‘Healthy and Safe Lifestyles’ and ‘Citizenship’ to explore issues and enhance pupil’s understanding. This subject area links to our School Council, Eco Council and Learning Council. It also forms the basis for many assembly themes and has links to the science curriculum. The Modern Foreign Language taught at Holly Park is Spanish. These lessons are delivered by a specialist teacher and the children enjoy learning basic Spanish vocabulary and being able to converse about various topics. It is taught in a fun, interactive way using music and songs, games and challenges to engage pupils. 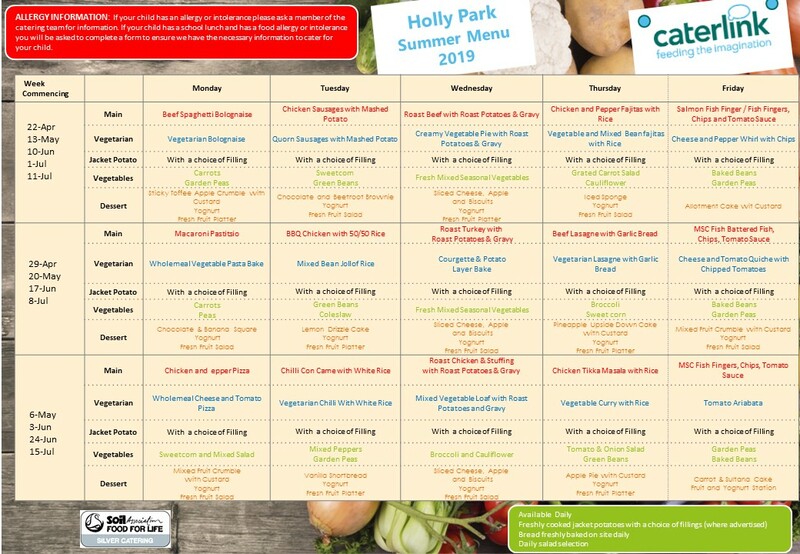 Holly Park has an all weather outdoor pitch that classes use for their outdoor PE sessions. Indoor PE (gymnastics and dance) takes place in the main hall. Children also take part in ‘Take 10’ each day – up to 10 minutes of physical exercise to music within the classroom. At Holly Park we are keen to encourage a healthy lifestyle and children are made aware of the vital importance of being active. PE also provides a great opportunity for pupils to build up their teamwork skills. Music is an important part of our curriculum. Learn more about it here. At Holly Park we follow the Christopher Winter program. This is a whole school approach and builds from Reception through to Year 6. Please find attached a copy of the presentation that we use at a parent meeting which outlines the curriculum coverage particularly from Year 4 onwards. Male and female – To be aware of differences in male and female animals. To know that new life needs a male and female. To describe the human lifecycle. Personal space – To consider different types of touch and ways of dealing with unwanted touch. Think about what personal space is. What is puberty? – Basic facts about puberty. Male & female body parts and basic changes. Understanding relationships – To consider physical & emotional behaviour in relationships. To know what form of touching is appropriate. Communicating in relationships – To explore positive and negative ways of communicating. To consider when it is appropriate to share personal/private information. Know where to get support if it goes wrong.